Some have suggested recently that renewed Iraqi crude oil production could be a boon to the country’s future, but a closer look shows that oil alone will not rejuvenate the Persian Gulf state. Iraq has returned to oil production levels it has not experienced since the 1980s, producing 3 million barrels per day in 2012, up from 2 million barrels per day in 2006. Moreover, Baghdad announced a goal of expanding production by 400,000 barrels of oil per day by 2013 and eventually increasing production to a whopping 10 million barrels per day by 2017. (By comparison, the top three producers, Russia, Saudi Arabia and the United States each produce 9.7, 8.9 and 5.5 million barrels of oil per day, respectively.) This all sounds positive at face value, but the situation in Iraq is more complicated than observers let on, and the country faces four looming challenges that illustrate why oil may not be its saving grace. Iraq’s overdependence on oil as a revenue source makes it vulnerable. Although it seems to have its oil industry back on track—with some important exceptions—the Iraqi government receives 95 percent of its total revenue from oil. This is a frightening statistic, and makes the government virtually dependent on oil. This “all in” mentality makes Iraq extremely vulnerable to price shocks, which could pose a major problem for the country at a time when the welfare of the global economy and the price of oil remain unpredictable. Prices fluctuate even in economically stable times making it difficult for the Iraqi government to project how much money it will have in its coffers. Moreover, the spillover effects from regional instability could also threaten Iraq’s oil-based economy. For instance, military action that bars Iraqi exports from passing through the Straits of Hormuz could impact the country’s ability to generate sufficient revenue. Oil revenues may not raise all sectors. Iraq has been unsuccessful at distributing oil revenue to jump start other sectors of its economy or address critical infrastructure needs such as water and power shortages. This is perhaps not surprising given that as a general rule, overdependence on oil quite often comes hand in hand with government corruption and poverty. Of the 31 countries in the world with 25 percent or more of total revenue derived from hydrocarbons, the average country ranks 114th by Transparency International’s Corruption Perception Index and 99th by the United Nation’s Human Development Index; Iraq ranks 175 in the CPI and 132 in the HDI. All is not lost for oil-based economies, however: Norway, Qatar and the United Arab Emirates boast some of the highest CPI and HDI rankings in addition to being dependent on the revenue stream generated by hydrocarbon production. In that light, policymakers in Baghdad should look to these other countries for successful institutional practices that might help all of Iraq reap the benefits of its oil wealth. Difficulty absorbing new oil production. Even if Iraq were to continue growth in oil production and achieve its five year goal, it would have difficulty exporting such a large amount of oil. Iraq simply does not—and likely will not—have the infrastructure needed to export such a large amount of oil. Efforts are being made to install additional oil-loading buoys in Basra, but given the dilapidated state of Iraq’s energy infrastructure and the slow bureaucratic system through which such projects must gain approval, some are skeptical if this will be enough to match exports with demand. A recent article in the Economist highlights Iraq’s geographic challenge: the country’s oil exports bottleneck through its only two options in Basra and a pipeline through Turkey to the Mediterranean, and developing more options seems unlikely. According to the Economist, giving the 40 year old Iraq-Turkey pipeline a facelift would be the best bet, but would not be easy. All other options are far more difficult. A previously agreed plan to build a new pipeline to Syria seems unlikely given the conflict there, and Iran and Saudi Arabia are both oil competitors. The country simply lacks good options for getting additional oil out to buyers. In fact, the Kurdish Regional Government (KRG) has independently signed contracts with foreign oil companies, despite Baghdad’s vocal opposition to such agreements. More recently, the KRG announced plans to build a new pipeline from Kurdistan through Turkey, another affront to Baghdad’s authority. Currently, Kurdistan must use Baghdad-controlled pipelines to export its oil, although it has suspended the oil flow through these pipelines due to the revenue dispute with Baghdad. (Kurdistan produces 300,000 barrels per day and in return receives 17 percent of the country’s oil revenue—not overwhelming, but a significant chunk of cash.) This prospective pipeline could allow Kurdistan to export its oil and gain revenue independent from Baghdad’s control. These realities coupled with the ongoing turmoil marring the country pose no small challenge to Baghdad and the rest of the country. Iraq likely faces a far gloomier path ahead than some realize. And oil alone won't be the answer to the country's woes. 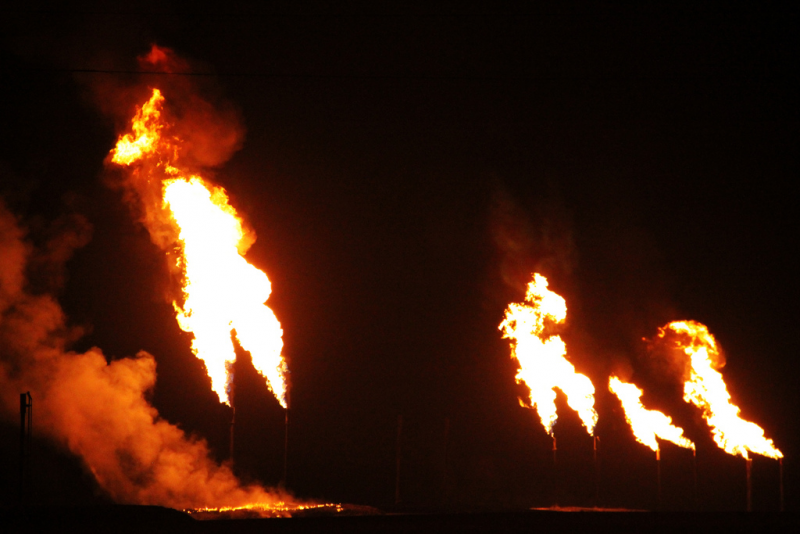 Photo: Gas flares burn at an Iraqi oil field in November 2010. Courtesy of flickr user Daniel Fogg. Joel Smith is a research assistant at the Center for a New American Security.